Earlier this year, I was invited to take part in an actual play podcast for Earthdawn. (For those who don’t know, this means the game is recorded and the audio posted online for people to download and listen to at their leisure.) We’ve been playing for a few months now, building up a backlog of gameplay so episodes can come out in a regular basis. The podcast launched yesterday. You can find it here. I’ve been having a good time. It’s nice to play for a change. I’m almost always the gamemaster, whether that’s for my local games (when I had time to run them), or for demos and one-shots at conventions. I went with a magician, which shouldn’t come as a surprise to anybody who knows me. I figured, as a way to generate some content for this site, I would go through the step-by-step process of how I created the character, with some thoughts and commentary on why I made the choices I did. This series will follow the process as described in the Earthdawn Player’s Guide. I decided to go with troll for Virag’s race. I don’t recall what the exact reasoning was. Part of this, I think, was based on what the other players were creating. But I like trolls, and enjoy putting together unconventional Discipline/Race combinations. Trolls are often cast in combat roles, and making my magician a troll goes against type. With my concept established, this is the step where the real nuts and bolts work begins. One of the difficulties when going against type and creating unconventional combinations is the uphill battle of the race’s starting Attribute values not being ideally suited for the chosen Discipline, and needing to spend more points to my scores where I want them. Trolls start with Dexterity 10, Strength 14, Toughness 12, Perception 9, Willpower 11, and Charisma 10. Perception and Willpower are the most important Attributes for a Nethermancer (and any other magician, for that matter), with Charisma not as important, but useful when dealing with spirits and the like. When creating a new character, I prefer a more balanced approach instead of maximizing the Discipline’s most important Attributes. I think ‘maxed out’ starting builds, unless you really know what you’re doing, are more likely to hinder than help. For instance, I could buy a +7 adjustment to Perception and Willpower (using 24 of my 25 available points), but that leaves me with just a +1 to add to one of my remaining Attributes. This means I could bump my Dexterity or Charisma from 10 to 11, giving me a Physical or Social Defense of 7 instead of 6. If I wanted some extra points, I could maybe afford to drop my Strength and/or Toughness… but then I’m hampering my chosen race’s strengths. I don’t think Earthdawn has “dump stats” as such. Even if a given Attribute isn’t particularly important for your chosen Discipline, it’s often helpful. Dexterity helps you avoid being hit. Toughness makes it harder to take you out. Perception and Willpower each help you resist spells, while Charisma helps you avoid being taken advantage of. For those not expecting to be hitting enemies with swords and such, Strength might count, but even then… a low Strength can limit your options in terms of what kind of armor you can wear and how much loot you can haul out of an abandoned kaer. All of this is a rather wordy way to say, I would rather have an Attribute score be one or two points lower than you could otherwise purchase, because it translates into better overall scores. Taking a +6 instead of a +7, for instance, saves you enough Attribute build points to give a +1 bonus to 3 other Attributes, or a +2 and a +1, or even a +3. Bringing up your Dexterity (for example) up enough to get an extra 2 points of Physical Defense is nothing to sneeze at. Generally, I recommend that a new character shoot for Step 7 in the Attribute (or Attributes) their talents are based on. Not just First Circle talents (though those are important), but the talents available through the first few circles, both Discipline and optional. Shooting for Step 7 in those Attributes means even a single talent rank puts you at Step 8, the first multiple-die Step at 2d6. If you look at the probabilities involved, the jump from Step 7 to Step 8 is significant, and if you can get it, you should. With all that theory-crafting in mind, here’s how I decided to spend my Attribute build points. 3 points for +3 to Dexterity, raising it to a 13. 0 points on Strength, leaving at its starting value of 14. 2 points for +2 Toughness, bringing it up to a 14. 12 points for +7 Perception, raising it to a 16. 5 points for +4 Willpower, raising it to a 15. 3 points for +3 Charisma, raising it to a 13. Raising Perception to 16 is an obvious first choice, since that puts me at Step 7. Both Nethermancy and Spellcasting are based on Perception, and are the bread and butter for a magician. While a 17 would give me a starting Mystic Defense of 10 (instead of 9), that costs an extra 3 Attribute build points, which as I explained above, limits my options. Also, if I look ahead, I get a +1 Mystic Defense at Second Circle, and I can spend Legend Points to raise my Perception to a 17 later on for that extra point of Defense if I really want to. Going with a 15 instead of a 16 for Willpower might seem to run against my earlier statement about shooting for Step 7 with my Discipline’s key Attributes, but the only talent based off Willpower to begin with is Frighten. A 16 doesn’t gain me any extra Mystic Armor, and (as we’ll see in a moment), the extra two Attribute build points are better used elsewhere. Spell damage is based on Willpower, but the starter 0-thread damage spells (Spirit Dart or Spirit Grip) are both Willpower+2, which still put me at Step 8. I can put 2 of my starting talent ranks in Frighten to bring that up to Step 8, but given my feelings on going against type… I decide to leave that for later. Given that I am only one point shy of a Step increase, though, means I will probably aim to have Willpower be the first Attribute I raise with Legend Points. Between those two, I’ve spent 17 of my 25 Attribute build points, leaving 8. If I divide them evenly between the other four Attributes, that gives me a +2 in each. But that puts both Dexterity and Charisma at a 12 — one point shy of both a Step increase and a Defense Rating increase. Given trolls have a starting Strength of 14, I can get away with not putting any more points there. That frees up 2 points, which get split between Dexterity and Charisma, bringing those each up to 13, granting Step 6 and a relevant Defense Rating of 8. Nice. The two points remaining go into Toughness, raising that to a 14. Unconsciousness Rating 28, Death Rating 34, Wound Threshold 9, and 3 Recovery tests per day. I could drop my Strength down to a 13, giving me an extra point to raise my Toughness to 15, which gives me an extra couple points of health and a Wound Threshold of 10… but I think things look good where they are. That will wrap it up for this installment. As you can see, none of my decisions were made in a vacuum. I looked at the derived characteristics, along with an eye toward what my talent choices are. This isn’t the only way to approach building a character, but I’ve given you some insight into my process. Hopefully it will help with yours. Next time, we’ll look at talent selection. 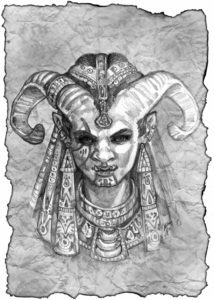 This entry was posted in Earthdawn, Role Playing on May 28, 2017 by Josh. Pretty cool troll art. Is it from the Travar book?